June 2007: One of Place Victoria's "family of five" from the spring of 2005 has survived and returned to Montreal to breed! 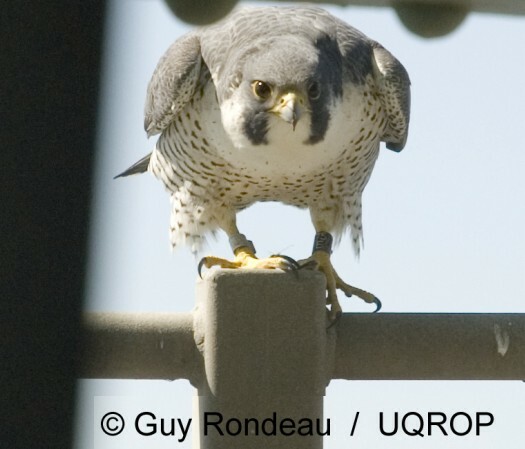 Guy Rondeau of the Union québecoise de réhabilitation des oiseaux de proie took the photo above while monitoring the Montreal area nesting sites this spring. The black colour identification band is clearly legible, and allowed us to confirm the identity of this bird. Click here for a photo of the same bird as a 25-day old chick. Thank you to Guy Fitzgérald at UQROP for notifying us about this discovery.